60 Hikes within 60 Miles: Houston uncovers hikes around Houston that previously had gone unnoticed. This is the essential guide to this area, from the Big Thicket of east Texas to the coast of Galveston Island. Explore most of the 138-mile Lone Star Trail with over a dozen hikes breaking up the trail into manageable segments. Hikes lead to old native homesteads, native prairies, deep forests, ripa… rian woodlands, urban byways, wildlife preserves along the Great Texas Coastal Birding Trail, wetlands, and numerous bayous and waterways. 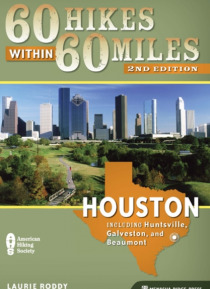 Each chapter serves as both a navigational aide and an interpretive guide to familiarize hikers with wondrous destinations in and around The Bayou City.